The Big Idea: Create spaces that become kids’ favorite places to read. There’s always room to read! Here are some tips to make your space a word- and story-rich environment. Devote an area in your space to reading. Fill it with shelves or baskets of books (you can get armfuls at the library! ), comfy seating, and soft light so that children can cuddle up as they settle into a book with a friend or family member. You can also find lots of digital stories to read on this site. Using blank sticky notes or labels, help children create labels for the objects all around them. Attach them to the matching objects. Point to and read them together as you notice them throughout the day. Reading happens everywhere, not just in libraries, on couches, or at desks. Take something to read wherever you go. Leave short, playful notes in unexpected places (drawers, lunchboxes, shoes). When kids find them, you can help them read them. Read together every day as part of kids’ everyday routine. 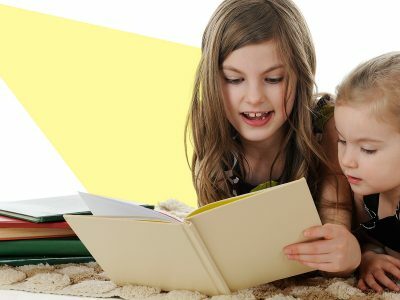 Older kids may like to read independently, so you can read alongside them (let them see you enjoy reading, too)!